Known genius and broccoli savant Tyler Kord is chef-owner of the lauded No. 7 Sub shops in New York. He is also a fabulously neurotic man who directs his energy into ruminations on sandwich philosophy, love, self-loathing, pay phones, getting drunk in the shower, Tom Cruise, food ethics, and what it's like having the names of two different women tattooed on your body. But being a chef means that it's your job to make people happy, and so, to thank you for being there while he works out his issues, he offers you this collection of truly excellent recipes, like roast beef with crispy shallots and smoky French dressing, a mind-blowing mayonnaise that tastes exactly like pho, or so many ways to make vegetables into sandiwches that you may never eat salad again. 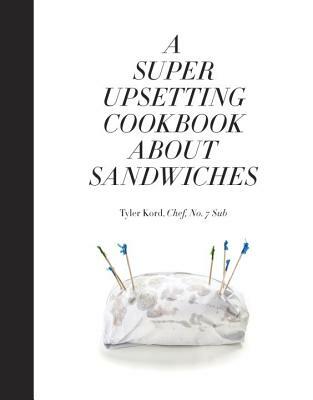 A Super Upsetting Cookbook About Sandwiches will make you laugh, make you cry, and most of all, make you hungry. TYLER KORD is chef-owner of the No. 7 restaurant group. He graduated from Oberlin College with a BA in English before attending the French Culinary Institute, where he stayed on to be sous chef to Alain Sailhac for four years. He then worked as sous chef at Jean Georges Vongerichten’s restaurant Perry St. before opening No. 7, which was named one of the top 10 new restaurants in the country by Bon Appétit.